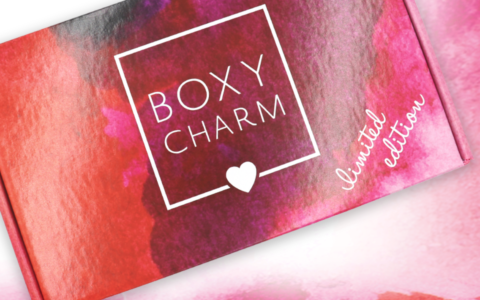 March’s box is the perfect array to welcome spring! Just look at those bright colors! Each box comes with two info cards. The first card lists the featured item of the month, and the second has all of Dapper Dog’s social media info as well as a little more information on the subscription. Murray is ready to dig in! 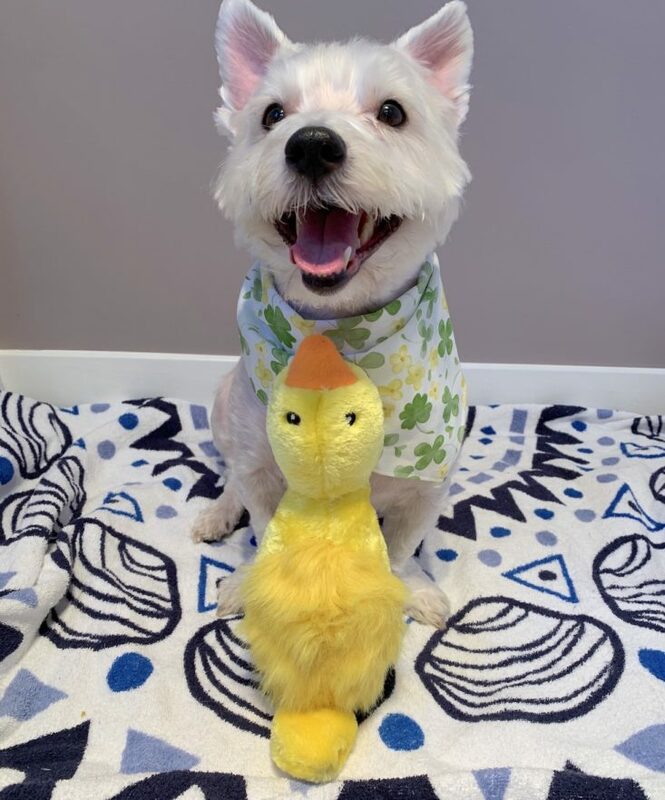 Murray is ready for Spring in this adorable three-leaf clover pattern. I tried this bandana on him a few different ways, and off to the side was one of my favorite looks. It is made of soft material, and Murray didn’t seem to mind wearing it one bit, although I think he preferred it to the side or in the back (less interference with his chewing). This is the first item that got Murray’s attention in this month’s box. He is usually more of a chewy, meaty treat kind of guy, but he is absolutely loving these wheat-free biscuits. Bocce’s Bakery makes all of their goodies in the USA, and this particular variety has coconut, vanilla, and turmeric making it a sweet wholesome treat for a wholesome pup. Murray isn’t always into playing ball, but he really enjoyed playing with this squeaky rubber ball wrapped in a plush frog. I squished the frog flat then threw it, and by the time Murray got to it he could still pick it up in its flat form. We played with this for a while, and he was acting like a wild man (refer to photo above!). This plush duck is ideal for my pup. He loves to play tug of war and to shake/throw/catch it when he is in play mode. This toy has an irresistible blaster squeaker and long hair on its back that is just perfect for flossing.. Does anyone else out there have a dog who does this?? 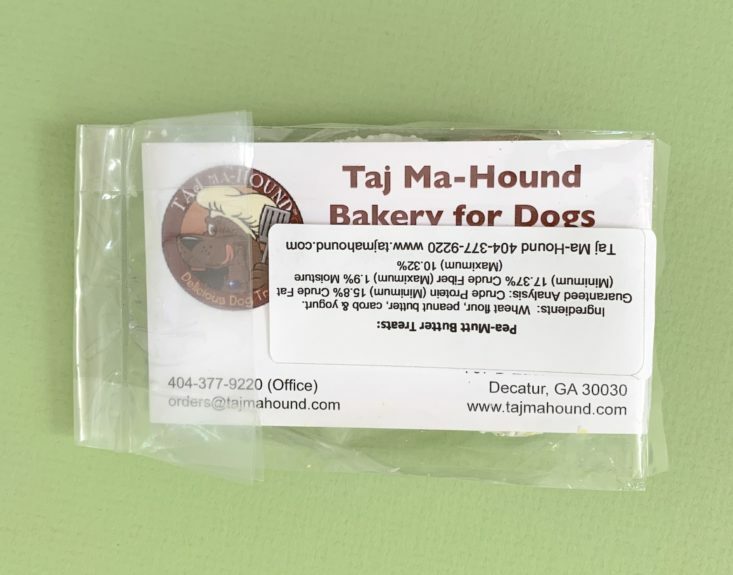 I couldn’t find this exact cookie, but there are a lot of other cute ones on Taj Ma-Hound’s website. At first, Murray just licked this cookie and carried it around the house; that’s typical for him and this kind of treat. Maybe he does this to soften it up? Anyway, once Ryan got home, he crunched right into it and had to showboat his delicious snack; Ryan was definitely jealous! This Pea-Mutt Butter flavored treat is made with restaurant quality peanut butter, honey and flour, and the icing is made from yogurt. Murray was obsessed with this non-rawhide chew! It is made from real Redbarn bully sticks, making it a treat that is worth begging for! Under close supervision, he chewed this in two sittings. This chew can break off into small pieces which could cause a dog to choke, so it is important to keep fresh water close by. I try not to let him eat a whole chew all at once, just in case it makes his stomach sensitive, but this didn’t seem to have any negative impact on him. This was by far the star of this month’s box for him! Verdict: Murray was very pleased with this month’s assortment of treats and toys. He seemed to feel confident in his new bandana, and he is enjoying his new snacks as I type this. I like that Dapper Dog sampled three very different types of snacks this month, too, and the festive toys will definitely be enjoyed all Spring. Can you still get this box if you sign up today?No. Monthly cut-offs are the 20th of each month to get that month’s box. Value Breakdown: This box costs $29.99 with free shipping, which means that each of the 5 items in the box has an average cost of $6. I think that’s a great value for what we received this month! Read all of our Dapper Dog Box reviews to find out more about this subscription box. Check out all of our Pet Subscriptions in the Subscription Box List. Rate, review, and follow this subscription on The Dapper Dog Box profile page. What did you think of the March 2019 box from The Dapper Dog Box? Murray is just the sweetest thing. I feel that Abby has a great way of describing how Murray thinks and feels about this box. She does an awesome job and Murray’s cuteness could make everyone want to subscribe to these great doggy boxes! Murray has stolen the show, I mean review lol, and my heart! I totally trust Murray’s reviews of the boxes! He is spot on and has exquisite taste! Add to that his photogenic looks and extra adorableness makes this a no brainer. Anyone who has a dog needs to order this box now….Murray would never steer you wrong! Unfortunately, my Westie cannot have this box (too many allergies including wheat).